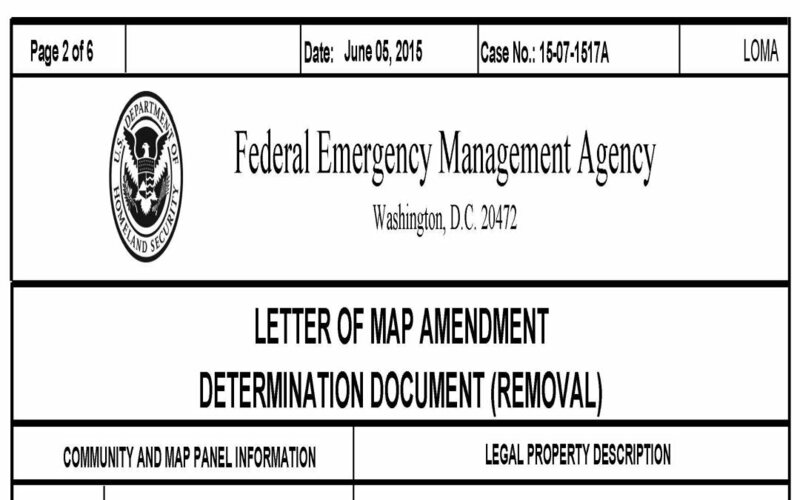 The property owner can file the form by printing out the application and mailing in the required documents to FEMA. This is a free service. It typically takes approximately 90 days for FEMA to process the information and reply. The property owner can file the form online via www.FEMA.gov. They will be required to scan an upload several documents, including a copy of the EC, their deed, a copy of the subdivision plat, and a copy of the flood map, along with other additional items. This is a free service. It typically takes approximately 60 days for FEMA to process the information and reply. The property owner can hire a FEMA approved Professional Land Surveyor or Engineer to file the information online via the eLOMA process. Fees vary from company to company, but typical fees are several hundred dollars. Once all of the required information has been submitted the results are immediate. If the file is selected for a random audit, it takes a minimum of 5 days to receive a finaldetermination once all the additional documentation is provided to FEMA. Keep in mind, that just because you submit for a LOMA, does not mean that it will be approved! There are certain indicators that can provide insight as to the probability that a structure will be removed that can be found on an EC. Having a knowledgeable Professional Land Surveyor or Engineer to advise you is key in knowing whether or not you should submit a LOMA.